Our morning began on the Irish. We opted for carts and a forecaddie, a decision our bodies appreciated. From the outset the Irish was picturesque and demanding. Forced carries and penal bunkers were the name of the game. The course felt like a mixture of resort golf and links golf. At times the undulating "dunes" felt contrived and at times they made you feel a million miles from Wisconsin. A few holes give you a tiny glimpse of the ocean...I mean lake, just enough of a sneak peak to get us excited for the afternoon. The Irish is a solid course that can stand on it’s own, however, the juxtaposition to the Straits course lends itself to unfair comparison, like a great cheeseburger at steak house. After a solid double bratwurst lunch I strolled through the pro shop and came to this conclusion: when it comes to logos and pro-shop purchases I prefer subtlety. The Whistling Straits logo is a bit garish and not suited for a polo shirt and barely fits on a ball. That being said I can’t walk away empty handed so I picked up a yardage book and a nice t-shirt so that when I’m at the gym people will understand why I do all those weird back and core exercises. With my remaining time I rolled a few putts and got ready for an afternoon stroll. Pit row between rounds. Rotating the tires (socks). 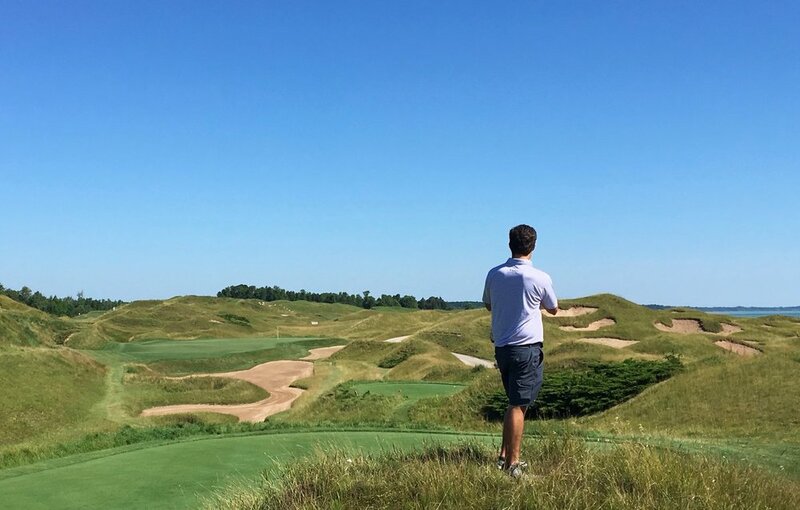 Whistling Straits is your prototypical bucket list, major hosting, big ticket golf course. Dye bends over backward to try and eliminate the throw away hole and make each moment last. With limited research, you’ll find that the topography that Whistling sits on is predominantly man made. That kind of blank canvas by the sea...I mean lake is quite impressive. Whistling Straits is an excellent example of photogenic architecture. It was hard for me to put the camera away, especially as golden light started to drape the course. I refer to it as photogenic architecture because it is pleasing to the eye but perhaps not so pleasing to the golf architect purist. From a design perspective, no particular hole stood out to me, but from a visual perspective I loved the course. The relentless bunkering (If Mr. Dye was paid by the trap he wasn’t shy about going for a cash grab) and subtle elevation changes made for beautiful framing. However, find yourself in a bunker that is no bigger than your bag just off the fairway and you may question Mr. Dye’s thought process. I’d be remiss if I didn’t share my lasting memory of this round and this trip. On the 9th hole Mike played a fade off the tee that got caught up in the wind a bit and ended up on a steep hill in the right rough. Being one to take on the challenge, he courageously navigated his way up the hill, located his ball, and took a stance. The ball was at chest height and sitting down. It would take an aggressive lash to advance the ball a mere 50 yards. He gripped and ripped and got the ball out but at a cost. The might of his swing took his feet out from under him and rather than fight forces of nature he extended his hands above his head with the club still firmly in his grasp and slid...face down...15 feet of hill into the fairway below. This graceful “dismount” brought our group to our knees with laughter. I have contacted Mr. Kohler about a possible plaque to commemorate the moment but have not heard back. The right rough on 9 is where legends are made. The back nine saw my game deteriorate as the visuals of the course enhanced to unprecedented levels. The 16th and 17th holes were especially striking, as they serve as a goodbye to the ocean…I mean lake. My drive on 18 pushed its way into the right rough, a mere 25 yards from DJ’s “grounded club heard around the world” incident. Unlike DJ I needed hybrid and still came up short on this Dye-abolical finishing hole. We all limped in and doffed our caps to honor a day well spent. We didn’t make it but a flip wedge from the 18th green before we settled on a dinner location, right then and there. With Whistling 18th and 9th as our backdrop we enjoyed our pub fare and relived the round until the sun set. Day three would be spent at Blackwolf Run, an ambience 180 from Whistling Straits.